An iron-clad, written lease agreement is a must-have tool for successful landlords. This document serves as the road map for everything from rent payments to evictions. But the lease will not stand the test of time unless you have the cooperation of the tenant. Communicate the pertinent rules and provisions that will be in the lease agreement during the initial discussions with the tenant. For instance, if your property is non-smoking, explain the specifics up front. If your policy is to serve a notice to quit if the tenant is three days late with rent, say so. If you make these disclosures in advance of the tenant’s agreement to rent from you, it will have a deeper impact and help foster a stronger commitment to following the lease terms. 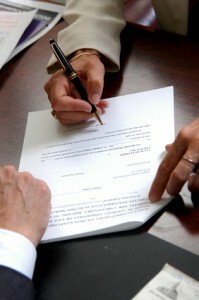 Provide the tenant with the draft lease agreement prior to signing. Then, provide the opportunity to discuss the lease with you in person. Allow the tenant to ask questions. That’s not to say that you have to consider any modifications, but it will give you a preview of unsettled issues that may come up during the tenancy. A dispute-free tenancy depends on the tenant understanding the lease terms. Alternatively, you can allow the tenant time to have a lawyer review the lease, and then speak with the attorney about any concerns. Often, landlord-tenant disputes occur because both sides have stuffed the bulky lease into a file and forgotten about it. A lease is not a piece of paper, but rather a process that both parties have to carry out each day. No matter how well it is drafted, a lease is no substitute for continuing property management. Keep the lease in the forefront of the tenant’s mind. Start by making a big deal about the lease signing. Do this in person. Before handing the tenant a pen, ask if there are any concerns about compliance. Instruct the tenant to sign in their full legal name. Prepare and sign a copy to give the tenant. Provide a folder or protective covering the elevates the importance of the document. A little ceremony can have a big impact by helping the tenant realize the gravity of their legal commitment. As the tenancy progresses, remind the tenant that you are still actively managing the property by providing rent invoices or receipts, routine inspections, and regular communications, like email notices, announcements or a monthly newsletter. When there is a legitimate concern about rule-breaking, speak with the tenant about it right away. To get the most from your lease agreement, your tenants need to feel like you are watching and paying attention. Be wary of any tenant who wants to sign the lease without taking the time to read it. This applicant may be more focused on trying to take advantage of you than they are in honoring the lease. Next post: Can Landlord Reveal Truth About Former Tenant?